Undesirable applications usually enter computers without permission. Searchudak.com, which is usually classified as a browser hijacker, acts the same; however, we are sure that you will quickly notice if it ever manages to sneak onto your computer because the settings of browsers you keep installed on your computer will be changed. Most likely, Searchudak.com will replace your homepage, default search engine, and the New Tab page. You will be allowed to set a website you like only after the full Searchudak.com removal. Specialists working at pcthreat.com say that this questionable search tool has to be deleted as soon as possible because it might put your system in danger. Many users do not believe when they hear that Searchudak.com can be dangerous, but you should know that we do not lie. Researchers have revealed that this search tool might perform several undesirable activities, so it would not be right to say that it is harmless. There are two main reasons that do not allow specialists to say that Searchudak.com is a search tool that can be trusted. First, it has been found that this search engine, even though it seems to be perfectly decent, might display sponsored search results. Generally speaking, such search results act like ads promoting third-party websites, so if you click on any of them, accidentally or willingly, you will be immediately taken to a third-party web page. Of course, this will happen too if you click on reliable search results; however, the chances are a lot higher that you will end up on a corrupted website if you click on a sponsored search result shown by the questionable search tool Searchudak.com. The distribution method also shows that it is better to remove Searchudak.com from browsers. Research carried out by specialists has revealed that browser hijackers often come bundled with free software. Of course, people do not even know that they agree to install it on their PCs even though they are informed about that in most cases. It is because they tend not to read the information provided to them, especially if it is written in a tiny font. Since there are hundreds of different browser hijackers out there, you should install a security application to protect your PC from future dangers. Do not download software from third-party websites you do not know anything about too because you might install malicious software alongside. If you have not managed to protect your computer and a browser hijacker is inside your system now, you will not only notice a new search tool set on your browsers, but will also see several modifications a browser hijacker has applied. Users who have some knowledge about computers will definitely see that the Start Page value data field in HKEY_CURRENT_USER\Software\Microsoft\Internet Explorer\Main has different information. Those who have Mozilla Firefox installed, will also see that data inside the prefs.js file has been modified by adding a string user_pref("browser.startup.homepage", "http://searchudak.com" there. Finally, you will come across the original line replaced with http://searchudak.com in three files belonging to Google Chrome: Preferences, Secure Preferences, and Web Data. 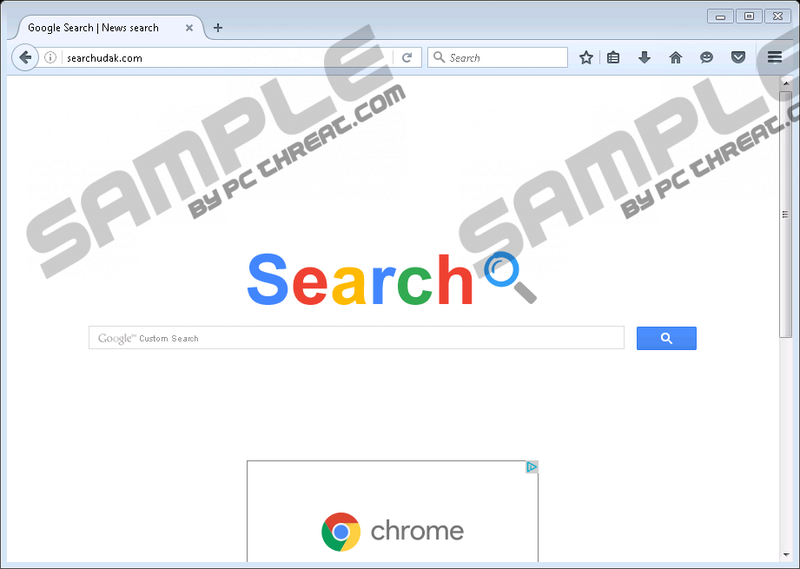 Browser hijackers like Searchudak.com can be removed manually or automatically. If you decide to employ the first method, you should use our manual removal guide to reset browsers to their default settings one after the other. Of course, it is not the only way to eliminate this infection. You can also erase it automatically. Download the security software from our website, upgrade it, and then launch the scanner to delete this threat fully, i.e. without leaving any of its components on the system. Open your browser and press Alt and T buttons. Click on the Advanced tab and then select Reset. In the box that shows up, click Reset once again. Click Refresh Firefox at the upper part of the page. Click Refresh Firefox once again. Quick & tested solution for Searchudak.com removal.